Have you heard about crafty vaporizer? I bet you have heard that somewhere before this and am looking hard to find a decent crafty vaporizer review. There are a few crafty vaporizer reviews out there (thanks to the Internet) but majority of them are not complete. As a marijuana user myself, I find that those reviews are either too shallow with information or isn’t good enough for potential buyers. The heat up time is longer than the rest of the products in the market. The product is made by Storz and Bickel, a Geman company. The company has several successes in manufacturing marijuana vaporizers such as the Volcano desktop vaporizer and Plenty plug-in vaporizer. Crafty vaporizer is the newest product to be launched by the company. 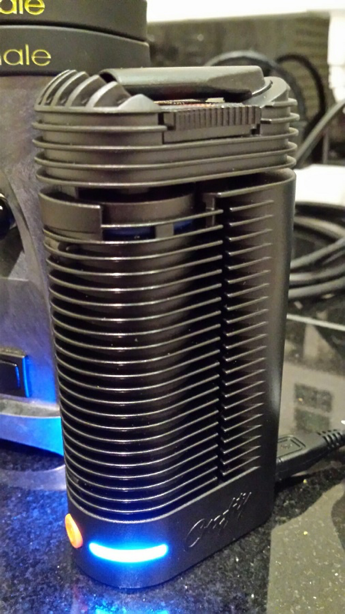 Among all the portable vaporizer reviews I had done, the crafty vaporizer review “wow-ed” my mind instantly! Overall, it is one of the best portable vaporizer (for me) based on the vapor quality, portability, design, looks and ease of use. If you are a complete beginner, crafty vaporizer is definitely the right one for you! At this point of review, crafty vaporizer costs anywhere between $339 to $399 from your local marijuana dispensaries. 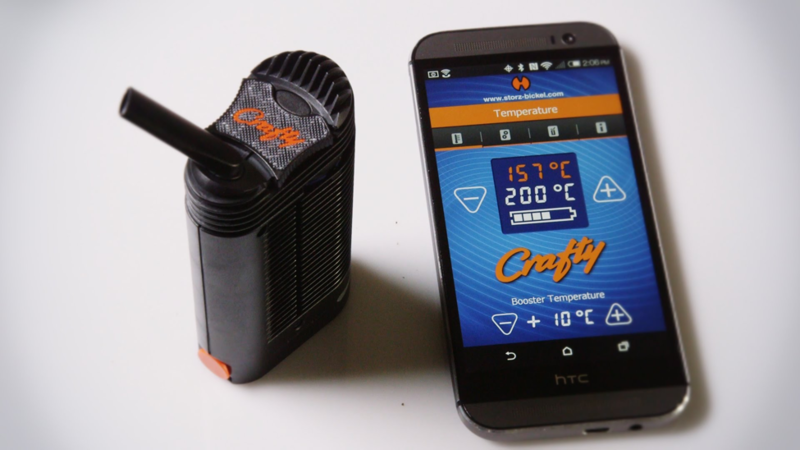 Yes, crafty vaporizer can be controlled directly from your smartphones (Android or Apple) by using specific applications. The application would allow you to control the temperate (two to choose from), adjusting the brightness of the LED on the device and even changing the notification settings. The application also displays the total hours of operations for the Crafty vaporizer (which is super awesome to say the very least) as well as the optimum temperature for different type of vaping products. Here are the dimension of the Crafty vaporizer: 4.3 inches tall by 2.2” wide and by 1.3” deep. It weights a surprising 4.8 oz which is roughly about 136 grams. The product lightweight and smaller size allows you to bring it around easily (and conceal it nicely) which scores highly in the mobility and size section. The product allows you to choose different temperature setting based on your requirements or type of weed you use. The default temperature is at 356 Fahrenheit (180 degrees Celsius) and if you require higher temperature, there’s the ‘boost’ option where crafty vaporizer can achieve as high as 383 Fahrenheit (195 degrees Celsius). On average, crafty vaporizer takes several minutes (approximately 2 to 3 minutes) to heat up. The device comes with a nifty function, vibrations which inform you that the heating up is completed which is great to avoid forgetting the heating process all together. Crafty vaporizer allows you pack up to 0.2 grams of the dry herb. If you are feeling adventurous, you can easily pack it up to 0.3 grams with super fine grind but always remember that over packing could cause additional draw resistance. In this Crafty vaporizer review, I would like to stress that it provides the similar results regardless the method of packing (loose, tight, half-pack etc). Also, there is a cooling unit on top of the gas chamber which will cool off the vapor before it hits your lips. However, the effectiveness of the unit is highly dependable on the temperature of the vapor. On average, a full battery allows you to use Crafty vaporizer for about 4 sessions. If on a moderate and continuous usage, the battery will last around 45 minutes to an hour max. The Crafty vaporizer would require at least 2 full hours to completely charge from 0 to a 100%. Another cool feature of the Crafty vaporizer is it allows you to use the vaporizer while charging which is also known as pass-through charging. The only takeaway from this is that there must be at least 20% remaining battery in the vaporizer. Crafty vaporizer is your choice of tool especially if you are interested with the smaller size and technology feature (using applications to control the vaporizer). While some may consider Crafty vaporizer as bulky, the overall features of it makes it stand out from the crowd. The vaporizer comes with a shorter warranty duration, which is two years compared to other brands which easily offer between 5 to 10 years. However, it is important to note that Storz and Bickel has a long and great track record for creating quality products. If you are a beginner, Crafty vaporizer may be one of the best vaporizers that is easy to use and you can kick start almost instantly. For more heavy and advanced users, Crafty vaporizer is also a great choice since it comes packing with some awesome features. Plus, the overall look of Crafty vaporizer does seem very high-end! What do you think of this Crafty vaporizer review?